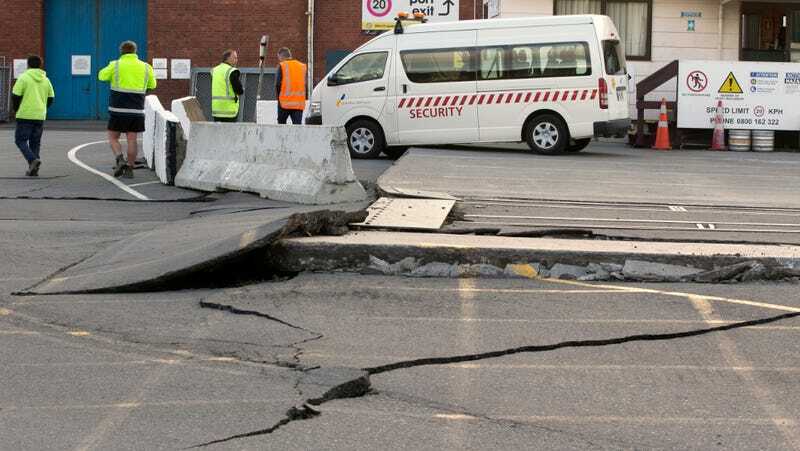 Seismologists are warning that the latest earthquake to strike New Zealand could trigger other large earthquakes in the coming days and weeks, but sensationalistic claims of a devastating “mega-quake” are likely overblown. The 2016 Kaikoura earthquake struck just past midnight on Monday November 14, with the epicenter located about 10 miles (15 km) northeast of Culverden on the South Island of New Zealand. It was the result of two separate, but simultaneous, earthquakes on multiple fault lines. The quakes, with a combined magnitude of 7.5 to 7.8, caused damage to buildings and roads, several landslides, and at least two deaths. Disturbingly, more quakes could be on the way. In light of Monday’s event, New Zealand’s government earth scientists, GeoNet, have worked out a series of scenarios and probabilities. The scientists say there’s a 12 percent chance of a magnitude 7 or greater earthquake happening within the next 24 hours, and a 32 percent chance of one happening within the next 30 days. With these scenarios in mind, science writer Alice Klein at New Scientist warned that New Zealand’s latest earthquake could trigger a “mega-quake,” particularly along the dreaded Alpine Fault that runs along the South Island. Over the past one thousand years, there have been four mega-quakes exceeding magnitude 8 along the Alpine Fault, including tremors in 1100, 1430, 1620, and most recently in 1717. These quakes seem to be occurring at intervals between 100 and 350 years. The 1717 quake happened 299 years ago, so New Zealand could experience its “big one” at any time. But it’s not immediately clear if Monday’s quake will be the catalyst for this dreaded event. According to GNS scientist John Ristau, an Alpine Fault earthquake would “produce one of the biggest earthquakes in New Zealand since European settlement.” New Scientist was keen to inject Ristau’s quote into its coverage, but failed to note that the GeoNet scenarios did not include any kind of triggering of the Alpine Fault. As Ristau himself admits, Monday’s earthquake is probably too far away from the Alpine fault to have a direct effect. Geophysicist Jesper Sören Dramsch told Gizmodo, “That does not mean it cannot happen, but other scenarios are much more likely.” Dramsch provided some scientific context. For the kettlebell to fall in this scenario, it would have to be unstable to begin with. Going back to earthquakes, this would mean that the Alpine fault would have to be similarly unstable. Dramsch says it’s possible that a 7.0 earthquake could act as a trigger, but there would already have to be an enormous amount of stress in the fault. Which leaves open the question of whether the fault wouldn’t have ruptured within a short time anyways. Dramsch says that measuring the level of stress in a fault is almost impossible, especially at depth, leaving us with probabilities instead of certainties of earthquakes happening.